If you share a PC with others, or for some other reason want to lock down specific parts of your PC, give Deskman ($49, 30-day free trial) a whirl. It lets you block an astonishing number of Windows features. Deskman lets you block access to many Windows features. Want to block access to a fixed drive, removable drive, USB drive, network drive, CD drive...well, pretty much any drive? Deskman can do that. How about blocking access to Internet Explorer, Windows Explorer, the desktop? Yes, it can do that. Will it block access to specific keys, or even mouse functions, such as left-mouse click? Yes, it can do that as well. 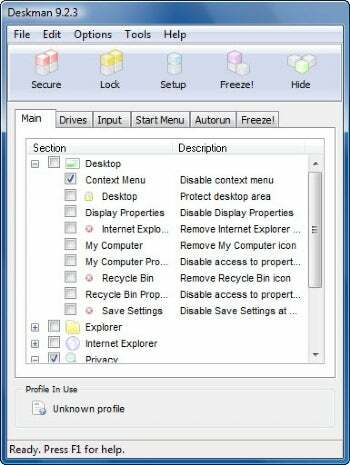 One of Deskman's more powerful features is Desktop Lock, which can lock out access to the desktop, and even cover the desktop with a translucent panel, hiding all windows. You can also allow access to certain features, and lock out others. And the Freeze feature is also useful. It will let anyone run the currently running programs, but no others. Making Deskman even more useful is its ability to create profiles that you can load when you want. So you may have one profile for when you want to allow a young child to use the computer, and another for when you want an older child to do so.